Take a look at our 2019 Program Calendar and Download it today! 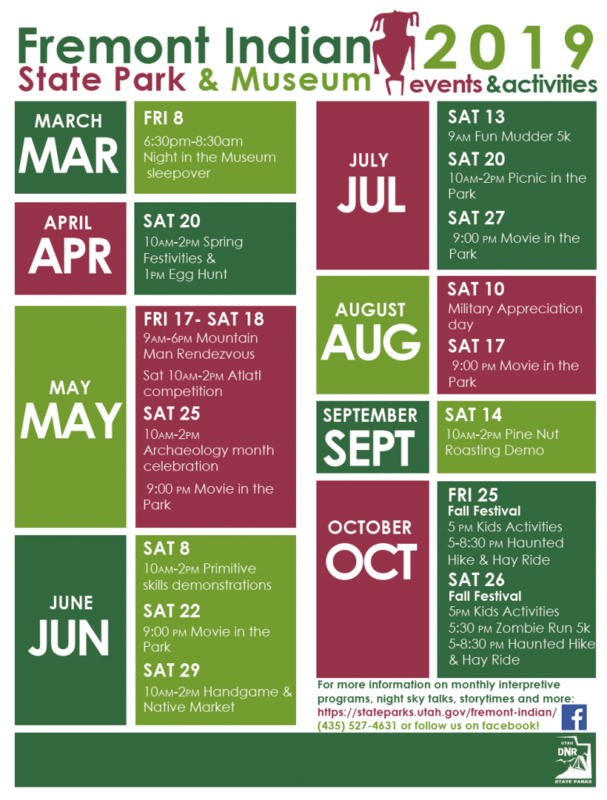 For more detailed overviews of events and listings for other interpretive programs look at the event descriptions below. 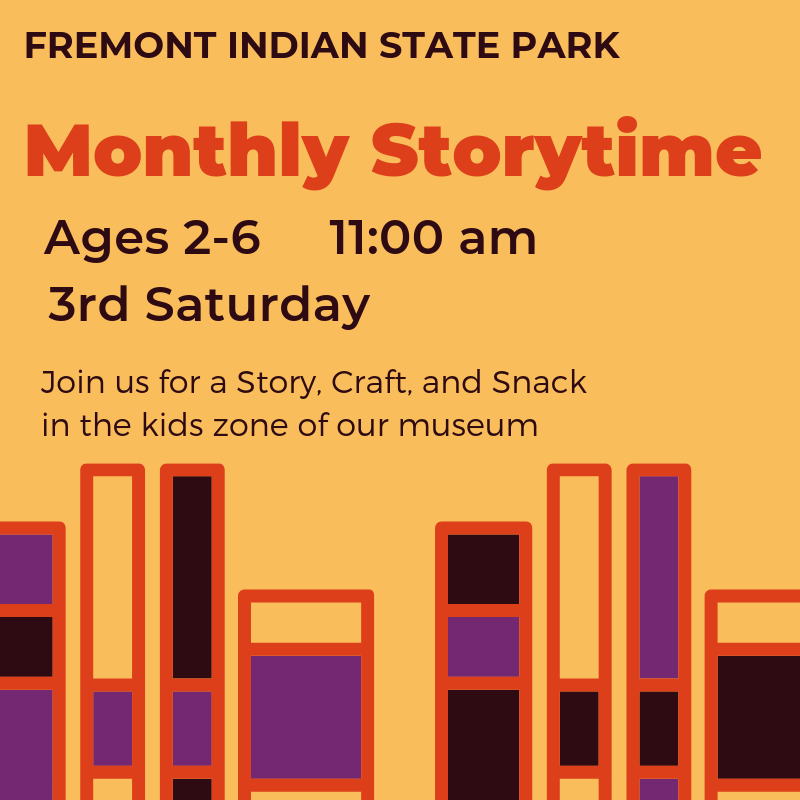 The third Saturday of every month we will be hosting a themed story time for children ages 2-10. Story time will include several stories, a short craft and a snack. Check out our Facebook page for updates on each month’s theme. This month’s theme is Dr. Seuss! Create your own masterpiece as local artist Rosalie Gunnel guides participants through creating an acrylic scene on canvas. 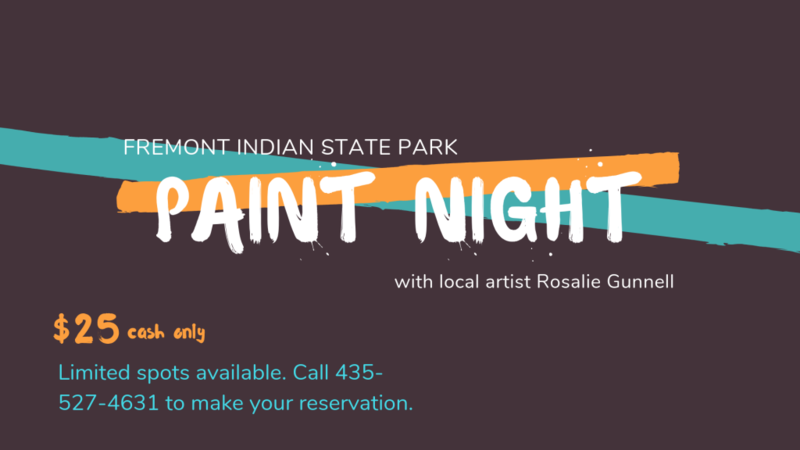 Space is limited so call the museum at 435-527-4631 to reserve your space. Please bring cash only. Celebrate the changing of the seasons with us with spring crafts, activities and our annual Easter Egg Hunt at 1pm. Atlatl Competition: borrow atlatl and spear from the museum and try your hand at a 3D animal target course. Dig deeper in the Study of Archaeology. Join us for a mini “dig” experience, archaeology crafts and activities and a talk with a real archaeologist. Enjoy a movie under the stars on our Rendezvous Flat. Follow our facebook page to find out what movie we’ll be watching and cast a vote to help us decide! Watch hands on demos by skilled tradesman in flintknapping, hearth cooking, weaving and more! Come and learn to play the handgame from local Paiute members. Browse handcrafted gifts from Native sellers. Stay Tuned from more information about this year’s Fun Mudder and for a registration link! Come to the centennial Picnic area for some old fashioned fun. There will be a food truck, historic games and water activities in Clear Creek. Take part in Traditional Pine Nut roasting and learn about this important part of Native Lifeways from local Paiute members. Enjoy the museum and trails in this spooky setting as you wander through our haunted hike, embark on our haunted hayride and play fall themed games. Dodge Zombies as you run for your life through the State Park in this spooky and fun 5k run/walk. Experience the numerous points of interest within our park. Explore the canyon we are located in to find Fremont Indian petrogylphs, pictographs, and pictoglyphs. Take a ride on an ATV through our park to connect to the longest ATV trail in the world. Descend into a reconstructed pithouse to imagine the lives’ of the Fremont Indians 1000 years ago. Come into our museum during open hours, 9:00 am – 6:00 pm, to discover our large collection of Fremont Indian artifacts.